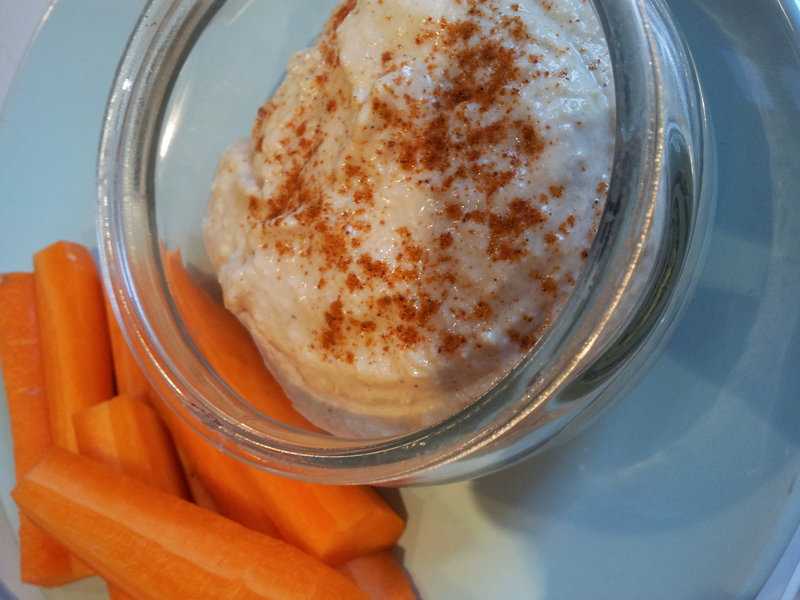 Hummus is a healthy and handy food that’s packed with protein, high in soluble fibre and a good source of healthy fats. It’s so versatile too, it can accompany a meal, works great as a dressing or sauce, in sandwiches or even on its own. Problem is, shop-bought hummus can vary hugely in terms of calorie and fat content. If you’re watching your weight, you can often be left wondering if it’s a healthy or less healthy choice (particularly in Belgium where the shop-bought hummus I’ve tried actually doesn’t have a calorie information on the label!). Making your own means you know exactly what’s in it and saves you money too! Like a lot of my recipes, I make use of my freezer and make this in large batches and freeze it. Hummus freezes well, just ensure you use an airtight container and leave a little room at the top to allow it to expand. When you come to defrost it, leave it in the fridge overnight and give it a good stir before serving. I’ve made my own hummus for a while, and I adapt the recipe to create different flavours, but this recipe produces a good base for you to use and add your own flavours to. 1. Crush the garlic and put into the food processor with the tahini and lemon juice. Blend. 2. Add the chickpeas and the yoghurt (I like to leave a handful of chickpeas out to have whole in the hummus, but you can add them all if you prefer). 3. Blend until you have a relatively smooth consistency (if it’s not runny enough you can add more natural yoghurt or a little water). Taste it and season it to your taste at this point too, you can also add paprika or other spices if desired. 4. Blend again, until desired consistency is reached. 5. Pop into an airtight container, remembering to add your whole chickpeas back in if you left some out earlier! It can be stored in the fridge for 3-4 days or in the freezer for up to 6 months. The nutritional data below is based on the above ingredients yielding 8 portions.